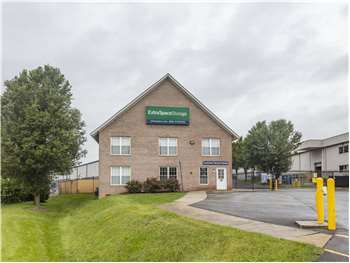 Extra Space Storage on Wormans Mill Ct. is a great self storage option for residents of Frederick, Waterside, Rivercrest, and Antietam Village. Located off of Frederick Fwy. between Liberty Rd. and N. Market St., our facility is across the street from NAPA Auto Parts and just north of Plastic Surgery One. We're also convenient for residents of nearby apartments, such as Country Hill Apartments, Taney Village Apartments, Applegate and Potomac Commons Apartments, and Frederick Greenes Apartments. When I got my first storage unit with Extra Space Storage I underestimated the amount of space I'd need. When it (soon) came time to upgrade, the folks at the office were extremely helpful and understanding of someone who wasn't exactly sure what he needed. I can't speak highly enough of the excellent customer service. I currently have 2 10x20 and a 10x30, I love my storage units easy access, manger Maggie is always there to help if I need it, I'm handicap she always looking out for me. It's always clean the other tenant are very friendly, I pick a good storage facility to house all my stuff in. I stored my stuffs there for 13 mon thsand never had any issue. The price is reasonable and the staff is friendly. The facility is not a nice as the U-Haul storage place in Frederick but for the price I was getting, I can't complain. I am quite satisfied with the storage facility but would have preferred to have lights in the unit. From time to time I go there to take out something and can't see no more than a few feet inside the door. The staff is always willing to give good service. Located in Wormans Mill Industrial Park-across from Triangle Motors on MD-355/Market St. Dominos Pizza is on the corner to the Industrial Park. We are the next left past the entrance to the Sports Plex. Routzahns Way/MD-355 - Burger King on corner. From the North, take US-15S. Take exit 16-Motter Avenue. Turn right onto Motter Ave/Opossumtown Pike. Merge onto US15N via ramp on the left. Merge onto MD-26E/Liberty Rd via Exit 17 toward MD-194/Libertytown/Walkersville. Turn right onto Routzahns Way/MD-355 (near Burger King). Turn slight right onto N Market Street/MD-355. Turn right onto Wormans Mill Court (near Dominos-across from Triangle Motors) 76 Wormans Mill Court is on the left. From the South US-15N to Exit 17 toward MD-194/Libertytown/Walkersville. Turn right onto Routzahns Way/MD-355 (near Burger King). Turn slight right onto N Market Street/MD-355. Turn right onto Wormans Mill Court (near Dominos-across from Triangle Motors). 76 Wormans Mill Court is on the left. From the East, I-70W. Merge onto US-40W via Exit 53B toward US-15N/Gettysburg. US-40 becomes US-15N. Merge onto MD-26E/Liberty Rd via Exit 17 toward MD-194/Libertytown/Walkersvile. Turn right onto Routzahns Way/MD-355 (near Burger King). Turn slight right onto N Market Street/MD-355. Turn right onto Wormans Mill Court (near Dominos-across from Triangle Motors). 76 Wormans Mill Court is on the left. I-70E. Merge onto US40E via Exit 48 toward Frederick. US-40E becomes MD-144E / W Patrick Street. Merge onto US-15N via the ramp on the left toward Gettysburg. Merge onto MD-26 E/Liberty Rd via exit 17 toward MD-194/Libertytown/Walkersville. Turn right onto Routzahns Way/MD-355 (near Burger King). Turn right onto Wormans Mill Court (near Dominos-across from Triangle Motors). 76 Wormans Mill Court is on the left.